Fritz Haber was born in Breslau, Germany, on 9th December 1868. His mother, Paula Haber, died during childbirth. His father, Siegfried Haber, was a successful merchant. In 1886 he studied at the University of Heidelberg under Robert Bunsen. He also studied at the University of Berlin. 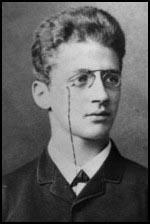 In 1894 he moved to the University of Karlsruhe where he worked with Carl Bosch. Haber married Clara Immerwahr in 1901. 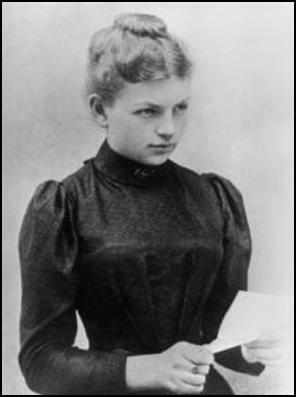 She was also a talented chemist and was the first woman Ph.D. at the University of Breslau. Their son, Hermann, was born in 1902. Haber continued with his research in developing chemical fertilizer. As Chris Bowlby has pointed out: "Crops needed better supplies of nitrogen to produce more food. Previously this had been supplied in a limited and laborious way by ships full of bird droppings or nitrates mined in South America. But in 1909 Haber found a way of synthesising ammonia for fertiliser from nitrogen and hydrogen... The fertiliser went on to be used on a large scale, bringing about a huge increase in crop yields, and practically banishing the fear of famine in large parts of the world." One scientist has claimed that "the most important technological invention of the 20th Century". Bowlby has pointed out "that as many as two out of five humans on the planet today owe their existence" to chemical fertilizers. Haber was awarded the Nobel Prize in Chemistry for his work on chemical fertilizers. During the First World War Haber offered his services to the German Army. He began experimenting with chlorine gas to be used in Trench Warfare. His wife disagreed that he should use his talents in this way. The first time it was used was against the French Army at Ypres in April 1915. The chlorine gas destroyed the respiratory organs of its victims and this led to a slow death by asphyxiation. One nurse described the death of one soldier who had been in the trenches during a chlorine gas attack. He was sitting on the bed, fighting for breath, his lips plum coloured. He was a magnificent young Canadian past all hope in the asphyxia of chlorine. I shall never forget the look in his eyes as he turned to me and gasped: 'I cant die! Is it possible that nothing can be done for me?' It was a horrible death, but as hard as they tried, doctors were unable to find a way of successfully treating chlorine gas poisoning." After the successful use of chlorine gas Haber was promoted to the rank of captain but when his wife heard about the use of chlorine on soldiers she picked up Haber's military pistol and shot herself in the chest. She died in her son's arms. Later his son, Hermann Harber, also took his own life in protest against his father's work in the war. 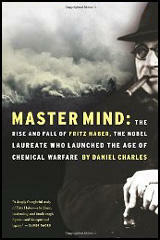 Haber became known as the "father of chemical warfare" and after the war he feared arrest as a war criminal. In the 1920s Haber and his team successfully developed cyanide gas. However, after Adolf Hitler gained power, Haber was refused entry to his research laboratory because he was a Jew. Haber went to live in Switzerland. Fritz Haber died of a heart attack in Basel on 29th January 1934. Haber's research into pesticide gases was later used by other scientists to develop Zyklon B. This was used by the Nazis to murder millions in their extermination camps. This including several members of Haber's own extended family. It has been claimed that as many as two out of five humans on the planet today owe their existence to the discoveries made by one brilliant German chemist. Yet this is the same chemist denounced by young German students today as a "murderer". 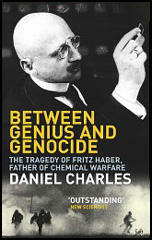 No-one personifies better than Fritz Haber the debate over science's capacity for good and evil. And there is more to his dramatic life even than this. For Haber personifies too the tragedy of a Jew desperate to be a patriotic German, whose life was destroyed after the Nazis came to power. And in the cruellest of all the ironies, his work was developed under the Nazis to create the gas used to murder millions in the Holocaust - including his relatives.